The images from this next installment of City Paint Phoenix are from my first tour of the city with the intent of documenting its street art. I made them on August 10 of 2014…and if you notice that the angle and the lighting are a bit off, or awkward, or could simply be better, do note that I began shooting at 9:15 in the morning and, while the sun was clearly up and above the horizon, it had not yet made it up above this building, so I was not able to stand far enough away to make straight-on images, as the sun would have been shining directly into the camera. At any rate, here’s what I found. 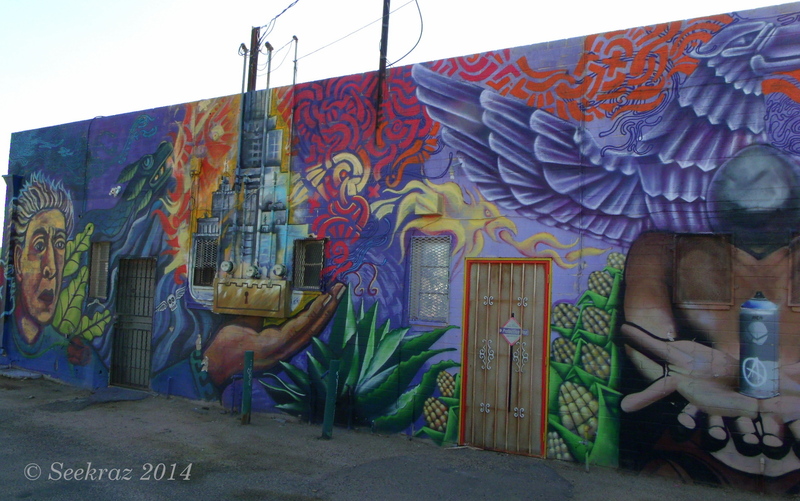 This mural is located on the back and west facing side of the Barrio Cafe, among other shops, at the address of 2814 N 16th Street. The Barrio Cafe has its own bit of artwork, so I will feature all of that in another post. The first three images are looking north along the building…and the gallery that follows includes photos taken while walking back toward the south. Remember that you can click on any image in the gallery to be taken to the slide show that presents each image in a larger format. If you’d like to see a photo series of the mural actually being composed, click on this link to Calle 16 Mural Project’s Facebook page and scroll down to entries dated 12/30/2012. It’s rather fascinating seeing it all come together. And…if you’d like to see more posts on street art and graffiti in both Phoenix and Salt Lake City, you can scroll to the bottom of this page and click on Street Art – Graffiti under the Categories widget. This entry was posted on January 17, 2015 by seekraz. 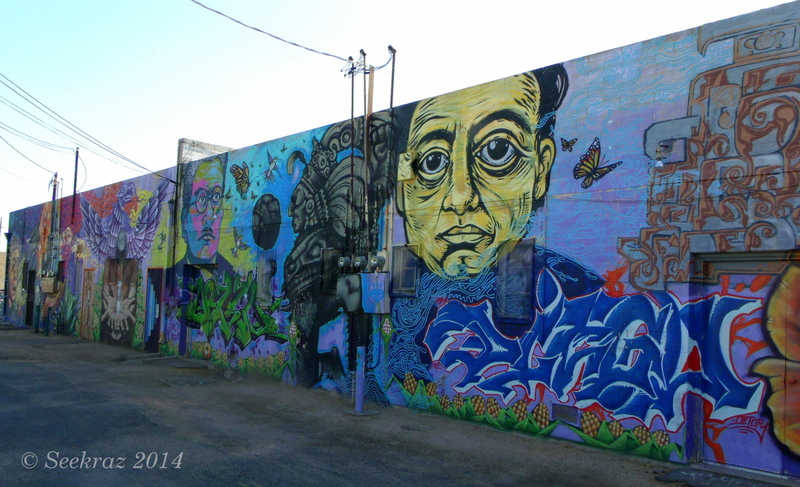 It was filed under Photos - Outdoors, Street Art - Graffiti and was tagged with 2814 N 16th Street, Barrio Cafe, building murals in Phoenix, Calle 16 Mural Project, images made 8-10-2014, Phoenix Arizona, photography, Street Art - Graffiti. Love the rich, detailed images that just seem to scream life. 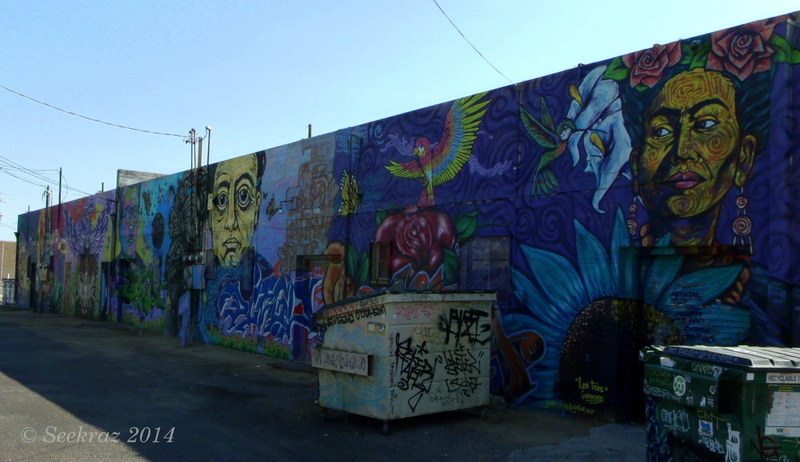 When I lived in Phoenix I remember some of the buildings having paintings on the side of them. But I believe this is some of the most awesome art work I have seen in a while. Scott thank you so much for sharing and I will reblog this for all to see. Particularly love the hummingbirds! I have a soft spot for them. They’re quite common out here…so nice to see them featured at this size. Looking for something? Start here….